LankaWeb – Why father and daughter failed in 1957 & 2000? Why father and daughter failed in 1957 & 2000? The slightest doubt created in the minds of voters by the opposition could cause the people to vote against it in the referendum. -A Constitution of a nation has to be acceptable to all people despite of their differences, which is an enormous task. In a strange development, when Bandaranaike proposed Federalism in 1926, James T Ratnam, his friend, and contemporary opposed the view. 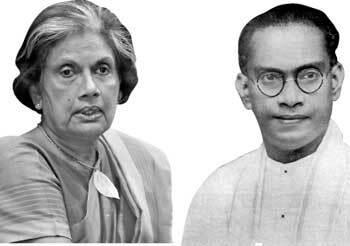 However 31 years later, on November 7, 1957, exactly 60 years ago…, Prime Minister SWRD Bandaranaike introduced a motion in Parliament for the revision of the Constitution. When C. P. de Silva, Leader of the House moved that the item No 1. on the Order Paper be taken for discussion, the controversial C. Sunderalingam, MP for Vavuniya, raising a Point of Order protested. The Speaker over-ruled him. Next, Leader of Opposition Dr. N. M. Perera objected to taking it up for debate saying that the Opposition needs more time to discuss the issue of revising the Constitution. Bandaranaike emphasised that in the present Constitution there was absolutely no provision for the guaranteeing of Fundamental Rights. The question of Federation would be considered by the Committee, he added. Leslie Goonewardene MP for Panadura said there was a glaring undemocratic principle which was not there in the original Constitution on putting off of the appointment of the Delimitation Commission. He said a large number of voters of Indian Origin were deprived of their votes. C. Vanniasingham-Kopay said on the last occasion SJV Chelvanayakam had referred to the nature of the Constitution whether Ceylon should have a Unitary form of Government or a Federal form and as the Prime Minister has given an assurance that this question would be looked into, he would not move an amendment. C. Sunderalingam-Vavuniya-Moved an amendment (b) which stated, to examine and discuss proposals for the establishment of a fully autonomous Tamil State, federated or separated as determined by a referendum to comprise the Tamil Territory ceded to Britain in 1802, and for the restoration of a Kandyan State …(c) to submit a draft of a Bill for the creation and Constitution of one or more States of Ceylon. SWRD Bandaranaike- you mislead D. S. Senanayake that is why we have this bad Constitution. In a strange development, when Bandaranaike proposed Federalism in 1926, James T. Ratnam opposed the view. Since 1948 we have replaced the Constitution twice. The first in 1972 under Sirimavo Bandaranaike, who left the people out of the process. The Parliament converting itself into a Constitutional Chamber that met outside the House of Representatives for formulating and drafting a new Constitution, the architect being Dr Colvin R de Silva. She made Sri Lanka a republic and scrapped the second chamber [Senate]. The next was in 1978, by J. R. Jayewardene with his own brother HW, and with no involvement of Parliamentarians either. Then he amended it 16 times, not for the benefit of the country but for his own. Apart from the above two successful attempts which bulldozed its way forcing them on the people by means of the power of two-thirds and five-sixths, we also experienced two unsuccessful attempts by father, SWRD as described above 60 years ago and again in 2000 by daughter CBK. In August 2000, after long and strenuous dialogue with all stakeholders. Professor G. L. Peiris, Minister of Constitutional Affairs devoted his energies, sweat, and toil along with Neelan Tiruchelvam [Who was eliminated by Prabhakaran for this ‘crime’] to compile this Constitution during a period of six years from June 1994. A unique feature of the draft was the creation of two vice presidential posts. Clause 57. (1) There shall be two Vice-Presidents of the Republic of Sri Lanka. (2) Every Vice-President shall be responsible to Parliament for the due execution and performance of the powers and functions of the office of Vice-President under the Constitution or other written law. (3) The two Vice-Presidents shall be from different communities, each such community being different to the community of which the President is a member. (4) Any citizen who is qualified to be an elector under the Constitution shall be qualified to be elected by Parliament as Vice-President. The draft in 2000 spoke about a united country where maximum power was devolved. It was a brilliant effort by CBK in analysis and assessment. The UNP opposed it and did not give the seven votes required for a 2/3rd majority in Parliament accusing Prof G.L. Peiris of sneaking in a clause to extend CBK’s term by two years. In reality, there was no such attempt; it contained a precise clause to do away with the Executive Presidency entirely, but at the end of her term in 2005. Was it that the UNP was not very keen on abolition, thinking that they could win it in 2005, or there were inclusions which the two parties did not agree upon. If the UNP members howl here today like a pack of jackals, it is a big question to me, Mr Speaker, as to how they can form a responsible Government in this country.” Dr. Jayampathy Wickramaratne who is the Secretary to the Interim Constitution Committee mentions this fact in his book on drafting Constitutions. Draft of a new Constitution died in Parliament due to political infighting. Fundamental principles of democracy require reverence for rule of law, free, fair and timely elections, freedom of expression, protection of basic rights and freedoms, independent judiciary. The Constitution or the basic/fundamental law of a nation can shape and influence generations to come. The present legislator has an unprecedented number of alleged corrupt members on both sides of the divide. Worse, there are rejected ones among both too. An introduction of a clause in the proposed new Constitution to prevent the Party Leaders from appointing voter rejected men to ‘represent people’ as done by the UNP, SLFP and the JVP disregarding the cries of a sovereign people,is vital. Today there are many specialists in drafting Constitutions, they are skilled in interpreting every expression of the interim report presented to the Parliament. Of course, they have a right to express their views to help the determination of the people who could reject a new Constitution being endorsed, in spite of the authority of their genuine representatives and the rejects in the legislator. The people are sovereign; they should have their say on these issues. It cannot and should not be left to the legislators alone. They should involve knowledgeable men and women from civil society. Keheliya Rambukwella who made a ‘valiant attempt’ to join his old party a couple of years ago thinks the US has arranged a new Constitution for us and the government is only trying to put it into operation. Former Minister of Justice Wijeyadasa Rajapakshe, PC, has queried the legality of the Constituent Assembly itself. He wrote several articles in newspapers, adding fuel to the fires already ignited by the JO. People generally, mobilized by the politicians, who manipulate them in a climate of insecurity, and fear would respond emotionally to these arguments. The slightest doubt created in the minds of voters by the opposition could cause the people to vote against it in the referendum. What is important is to give adequate time for the people to learn and understand the proposals rather than blame the opponents condemning them for lying and misinforming the voter. If such an environment is created the voter will certainly take a well informed correct decision. The real problem here is that the government is unable to contradict the JO’s claims by producing significant testimony to prove that there is no space for such circumstances in the report. Votes alone cannot and will not make laws acceptable; for laws cannot be measured in terms of votes. A Constitution of a nation has to be acceptable to all people despite their differences, which is an enormous task. Hence the need is to act watchfully and diligently. Government Pulling in Different Directions? If the process is bungled, which appears to be the case—it will adversely affect reconciliation and national integration effort as well. The JVP and UNP want the Executive Presidency abolished; while Government’s other partner is for retention. Unity Government is at odds on the question of reforms. The UNP and the SLFP are pulling in different directions on two crucial issues: Executive presidency and power devolution. It must put its own house in order first and speak with one voice. Otherwise, people would think the rulers are a set of comedians only blaming others for blocking their efforts. Both the Father and Daughter dependent on India and Indians for their survival. They were and are not bothred about the Sinhalese.